Make a rosy-pink frosting with fresh strawberries. 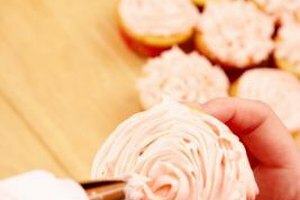 You can add fresh strawberries to a basic buttercream or cream cheese frosting recipe for an eye-catching, rosy pink topping. This brightly colored frosting gets its characteristic hue and unmistakable flavor from fresh strawberries. Simply slice the berries thinly and they'll easily break down in the frosting as you beat it. Use this frosting with your favorite cupcake recipe. For a matching garnish, top the frosted cupcakes with a few strawberry slices. Beat together the softened butter, vanilla extract and sliced strawberries with an electric hand mixer or stand mixer. You'll need 1 stick of butter, 1 teaspoon of vanilla extract and 1/2 cup of sliced strawberries to frost 12 cupcakes. To make strawberry cream cheese frosting, add 8 ounces of softened cream cheese to the mixture. Beat until the strawberries have broken down and the mixture is smooth. Gradually beat the powdered sugar into the mixture. You'll need about 4 cups of powdered sugar for every stick of butter. Beat the frosting until it is light and fluffy. Add extra powdered sugar if necessary until the frosting reaches your desired consistency.